OC Dermatology is 25 years old this year. Help us celebrate by looking for our “25” specials each month. HydroFacial MD Special– Receive one free add-on with every HydroFacial MD treatment purchased in January. 20% off all spa boutique candles, scarves, robes and other non-skincare products. Stock up for Valentine’s Day, Birthday gifts and for yourself! Purchase any ColorScience Regimen (Oily/Acne, Sensitive, Pigmentation or Anti-Aging) and receive a FREE ColorScience Travel Kit ($78 value). 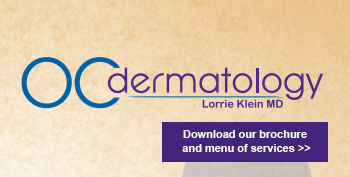 This month we are featuring Dr. Klein’s favorite (and probably yours too)… SkinMedica Essential Serum! This month BBMD members receive 20% off SkinMedica Essential Serum.